Create parametric BIM geometry with ARCHICAD and Rhino3D Grasshopper. Learn how to use Graphisoft’s free plugin to make your favorite CAAD tools work together. This article is is all about installing, connecting and understanding the workflow. In other words: the framework of your ARCHICAD-Grasshopper collaboration. That being said, it is not a modeling manual. For constructing parametric BIM models with Rhino3D, Grasshopper and ARCHICAD refer to these resources. This is actually a breakdown of Graphisoft’s User Guide. I highly recommend reading it. Reminder: In another article I put together some useful learning resources for Rhino3D and Grasshopper. This article is about starting Grasshopper and its basics concepts. Run your installation app. The installer will place the connection plugins in the right place. If not, check the next chapter. For further information, check Graphisoft’s User Guide. Start ARCHICAD, start Rhino3D. In Rhino3D, start Grasshopper. As you see, there’s no Rhino3D window up front. Most of the time I work with Grasshopper and ARCHICAD without having to check with Rhino3D previews. See next chapter for this. Now to make ARCHICAD and Grasshopper actually work together you’ll have to do something. You’ll see a small window appear that works as remote control for the connection. First of all you have to click on Start Connection. When the connection is active the wheel starts spinning. Now the connection being active, you may of course stop it again: via Break Connection. So that’s pretty straightforward. 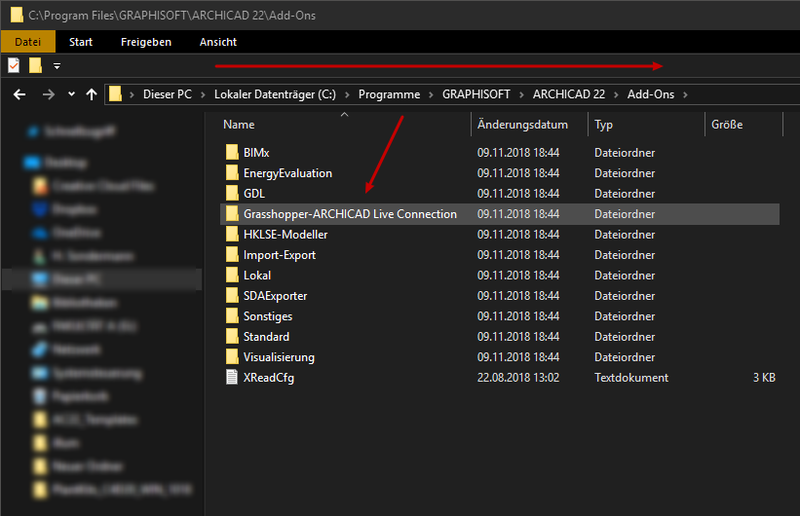 Also, the window shows which Grasshopper file (.gh) your ARCHICAD project is connected with. This can only be one file at a time. And it shows only when you’ve also linked your Grasshopper file to your ARCHICAD project. Which has yet to be done. If you need to connect one of the other files, mark it and press Connect. That simple. 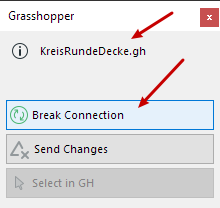 When you connect another Grasshopper file to ARCHICAD and this new file doesn’t yet show up in ARCHICAD’s control window, break and restart the connection from there. 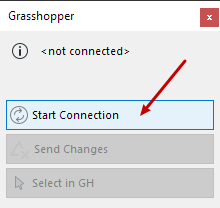 The newly connected Grasshopper file should show up. Two last things: First, the button Send Changes switches between automatic and manual update. It referes to changes made in ARCHICAD that effect Grasshopper’s definition. (Like in a Favorite definition.) 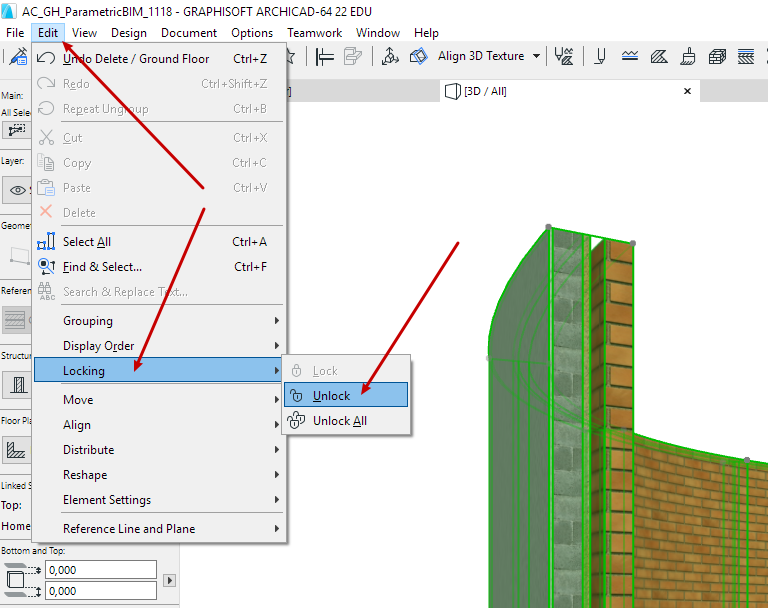 Second, Select in GH allows selecting components in Grasshopper that relate to selected ARCHICAD geometry. 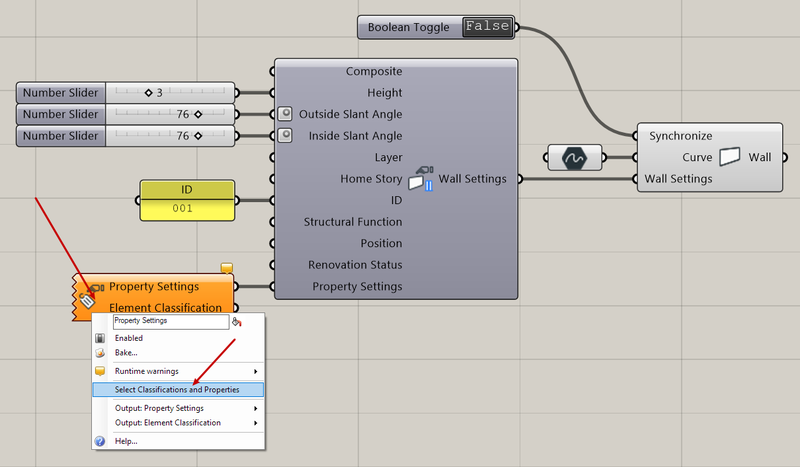 Rhino3D or ARCHICAD supply Grasshopper with input geometry. In Grasshopper this input geometry is parametrically developed into complex geometry with optional BIM data. 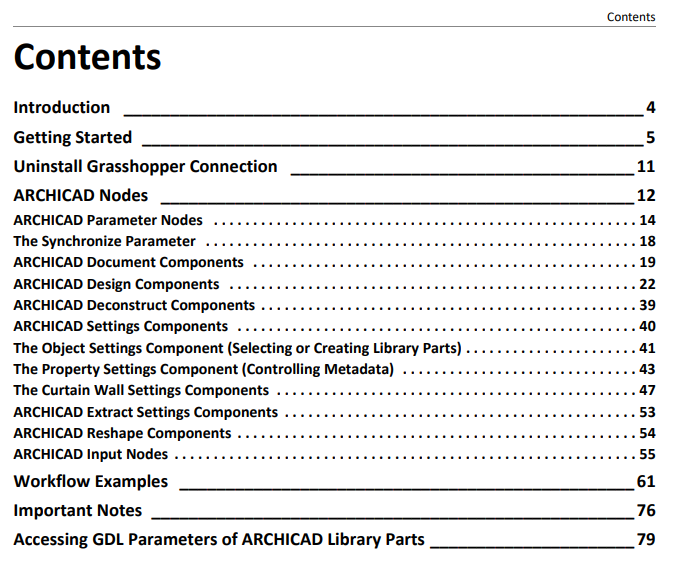 ARCHICAD receives Grasshopper’s output for BIM model implementation. 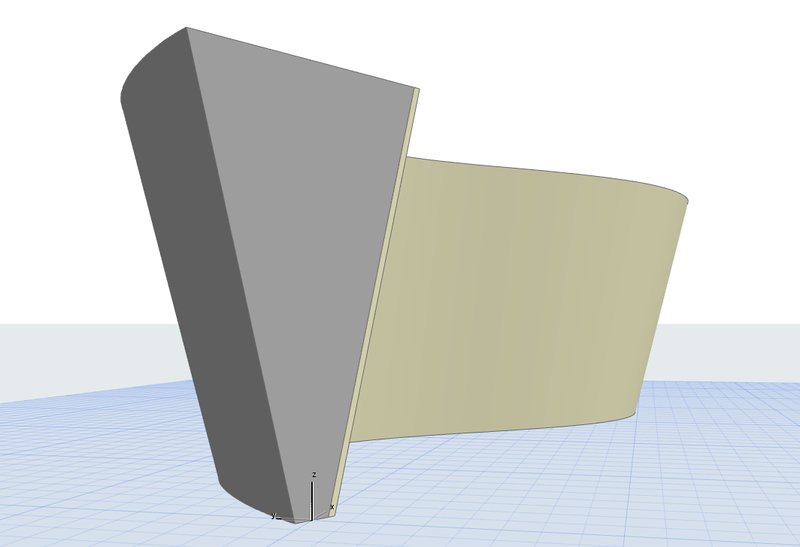 Let’s also assume the wall isn’t drawn in ARCHICAD but comes into our model as output from Grasshopper. As an ARCHICAD user you know that a wall needs a reference line. This line can be considered the geometry input of the wall. In this case, it’s a curve. 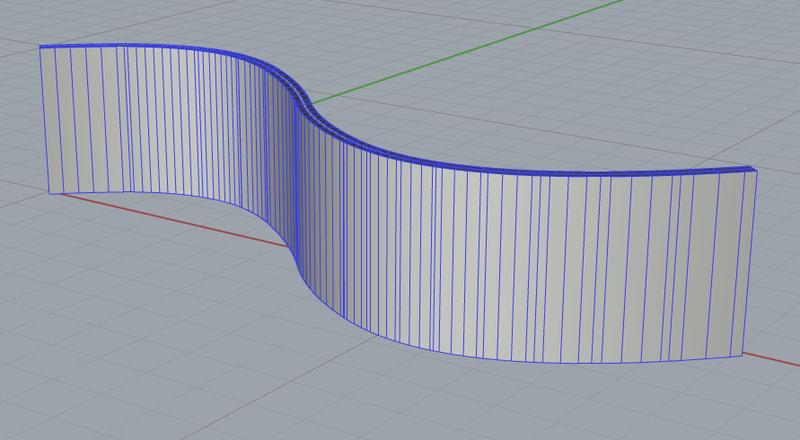 Draw the curve in Rhino. 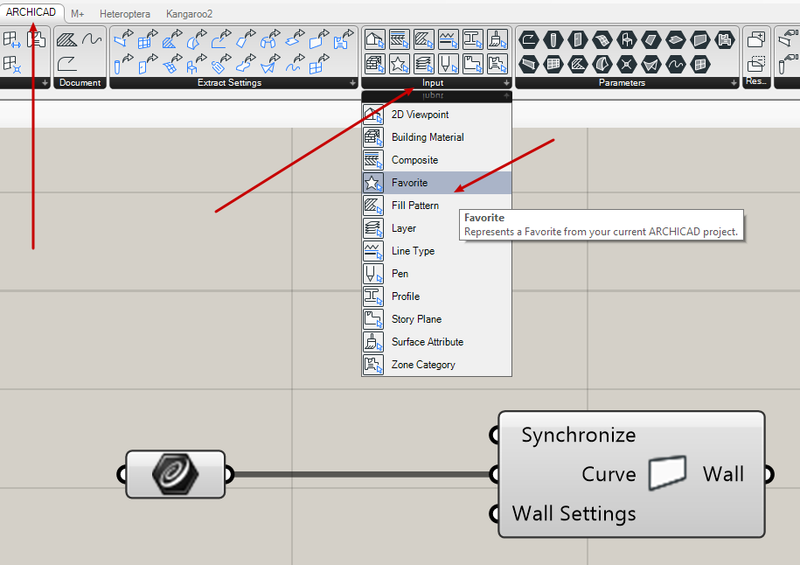 Draw the curve in ARCHICAD. … right-click and choose Set one Curve. 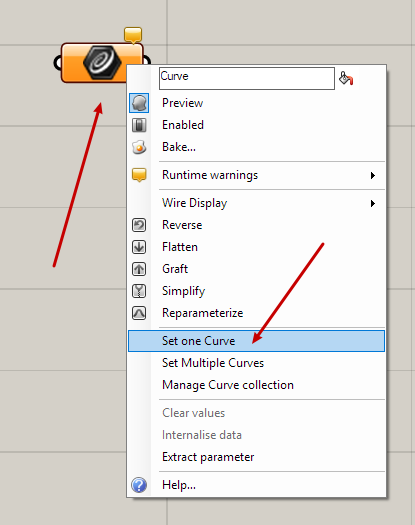 You are prompted to select the curve drawn in Rhino. 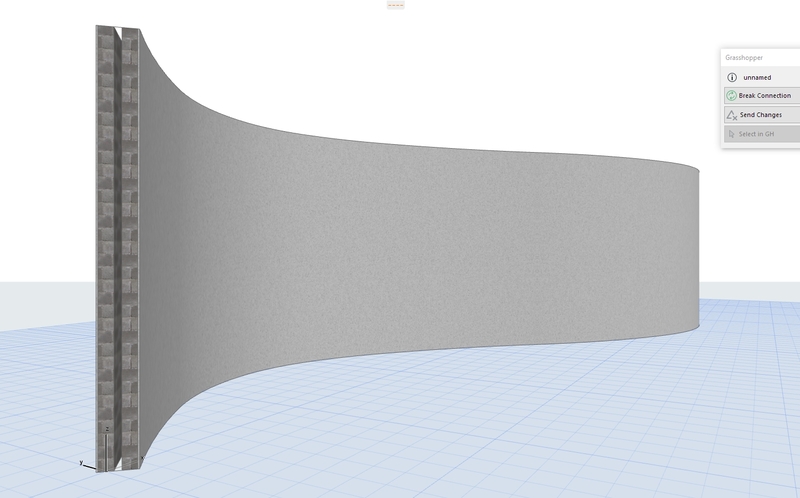 After selecting it the Rhino curve has become the reference of Grasshopper’s Curve component. As a result, the component icon has changed from orange to grey. The wall’s reference line was drawn in Rhino3D. The line was referenced into Grasshopper. 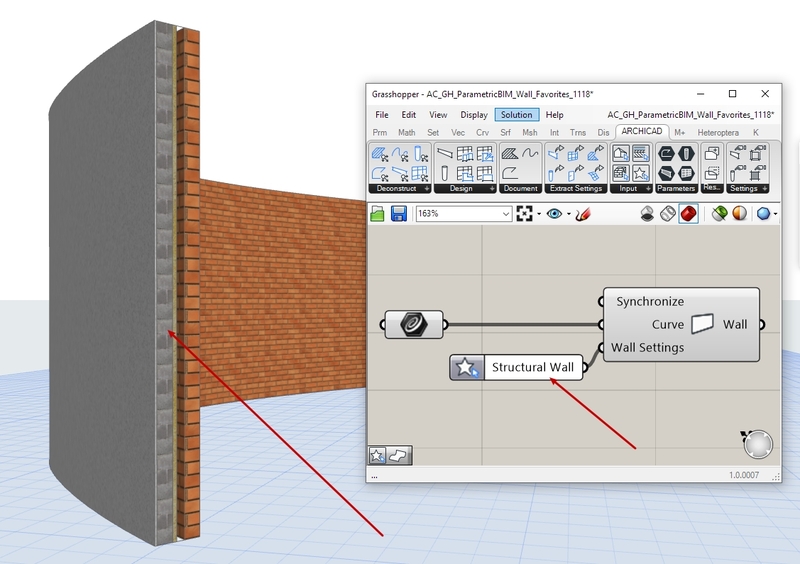 The output wall shows up in ARCHICAD (coordinates relate to Rhino). A preview is shown in Rhino3D. Tool choice is crucial – this curve was drawn using the Spline tool. Now select the Spline in ARCHICAD’s Floor Plan window. The component turns grey as a result. (If not, check the connection status.). 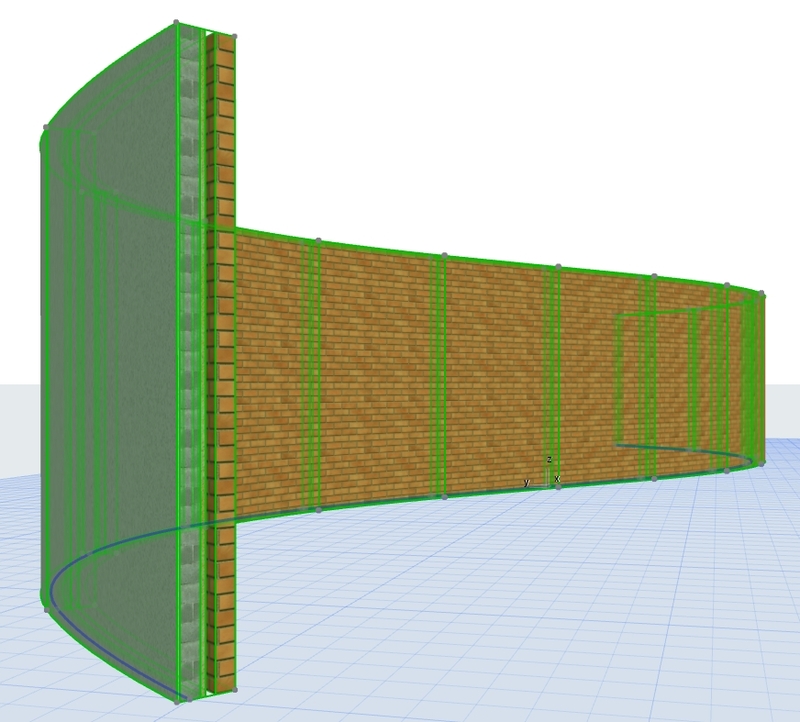 The wall’s reference line is drawn in ARCHICAD. The line is referenced into Grasshopper. 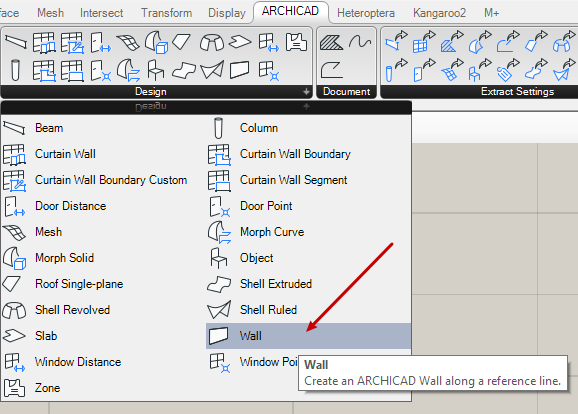 The output wall is placed in ARCHICAD (coordinates relate to Rhino). As you see: Whether input comes from Rhino or ARCHICAD, the result is the same. So is the effort. Therefore, which strategy should you follow? Because, if you can draw your input geometry in ARCHICAD, you might consider to skip Rhino completely. But it’s not so simple. A Rhino NURBS curve is itself parametric – it can be changed by parameters in Grasshopper that again depend on other parameters … and so on. 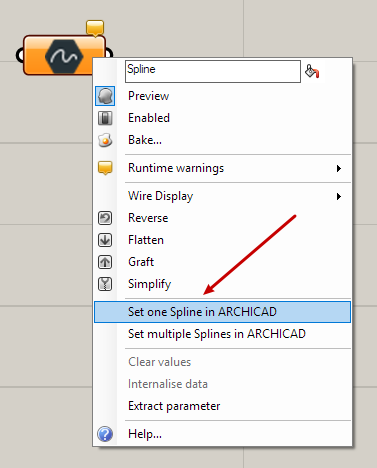 An ARCHICAD Spline is not parametric – it can be changed by mouse-dragging spline points. 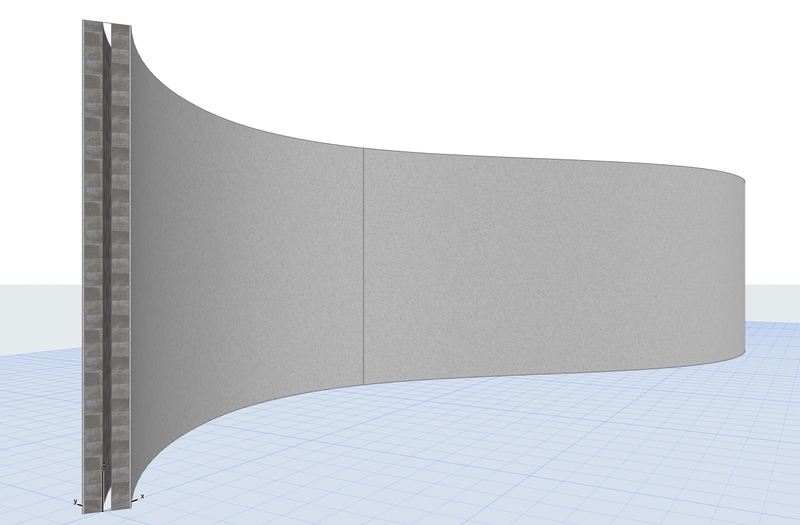 As the wall can change its curvature according to the reference curve, with Rhino’s NURBS curve it will be more parametric than with ARCHICAD’s Spline. However, this does not mean that the ARCHICAD-Spline-approach is wrong. Or less elegant than the Rhino-NURBS-strategy. Keep in mind: Designing truly parametrically responsive geometry can become pretty complex in Grasshopper. And this is just not always appropriate. Bottom line: Figure out in advance the degree of parametric control you want to have over your building parts. And adapt your workflow accordingly. In a BIM model, changeability of geometry is crucial. Why? You can construct building parts in a second. (Well, most of them.) But then, you spend hours to change them – over and over again – in the process of planning. 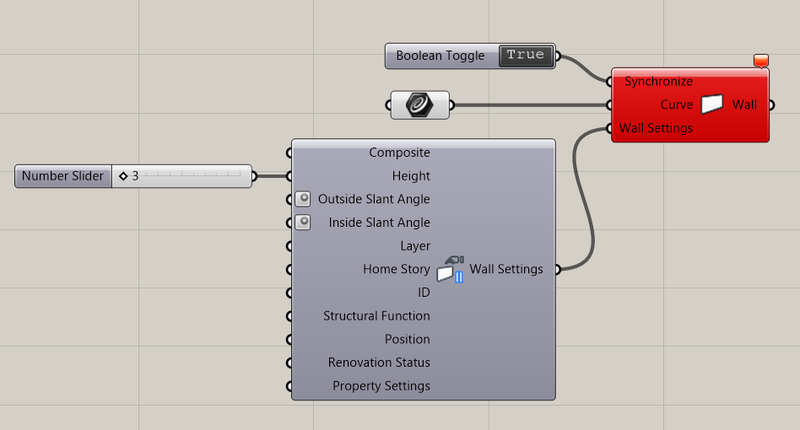 In Grasshopper, use a Settings component to connect to a Design component (described in this chapter). In Grasshopper, use a Favorite component to connect to a Design component (see next chapter). 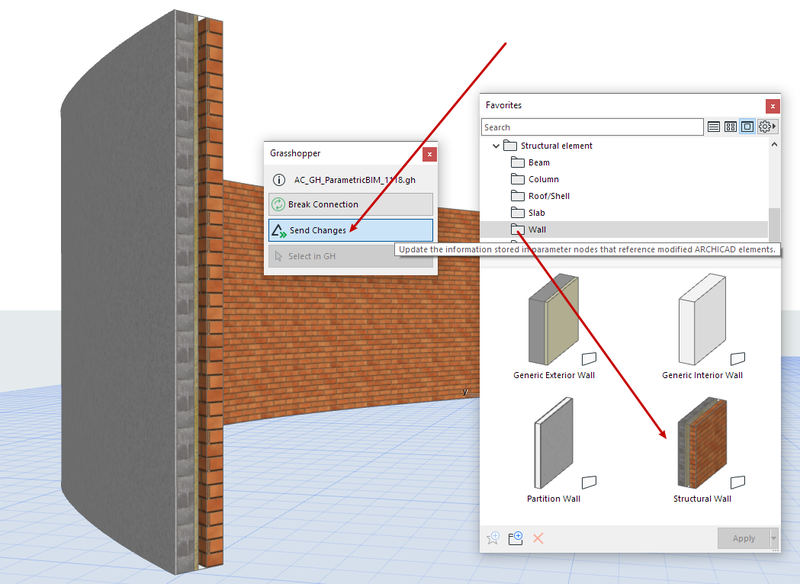 In ARCHICAD, unlock Grasshopper-made BIM elements and apply conventional ARCHICAD settings (see yet another chapter). Again, more than one way to do it. However, as with the building strategy above, there are pros and cons for each of them. Let’s look at the first option. Since ARCHICAD’s classification and property scheme is not part of this article I suggest you refer to Graphisoft Help pages if needed. It should be obvious why using the Settings component makes sense: Each Settings input can be fed by other parameters which makes your BIM element truly parametric. Because, again: Using ARCHICAD and Grasshopper together is meant to create a Parametric BIM model. For further information about the connection plugin check Graphisoft’s User Guide. Which Favorites can you choose in Grasshopper? The ones that are stored with your running and connected ARCHICAD project. 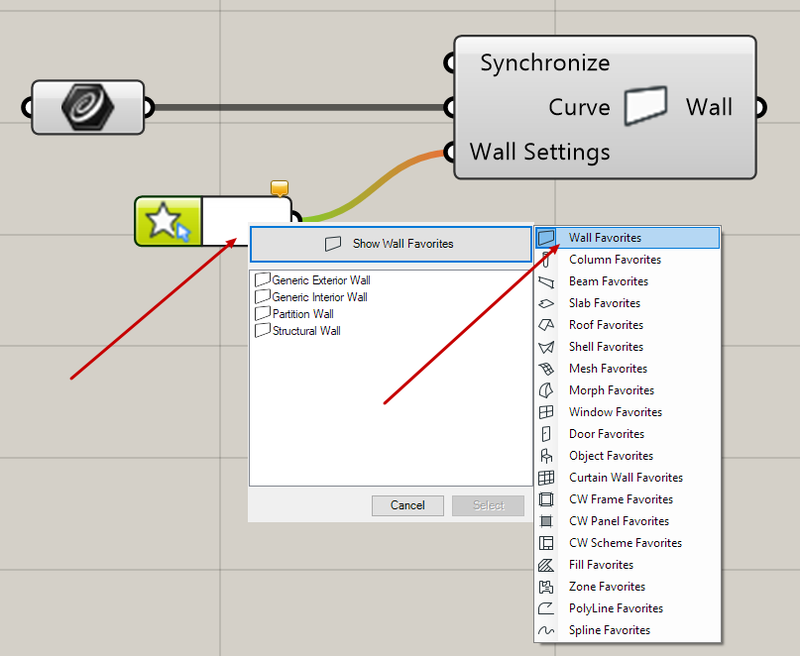 So in order to define a specific kind of wall, just define a custom Favorite in ARCHICAD. 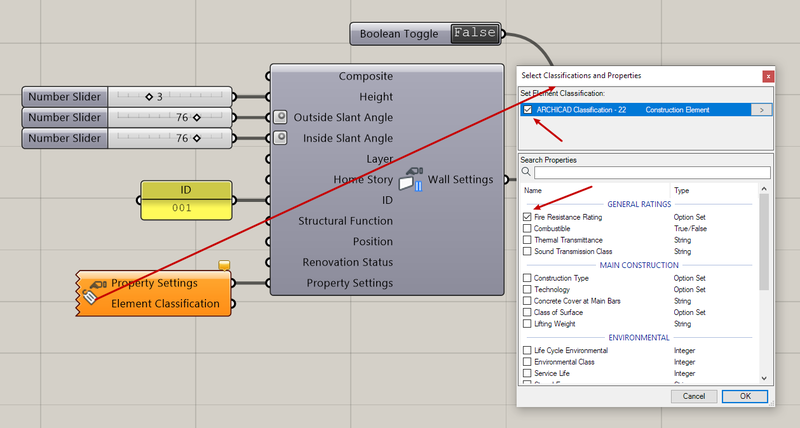 This way, you can use it in Grasshopper via a Favorite component as shown above. 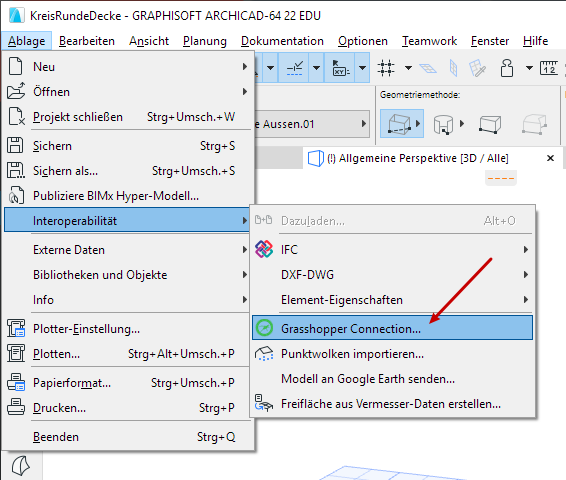 I won’t show you how to define and handle Favorites in ARCHICAD – check Graphisoft Help pages if necessary. It’s easier, because you define your settings in good old ARCHICAD. 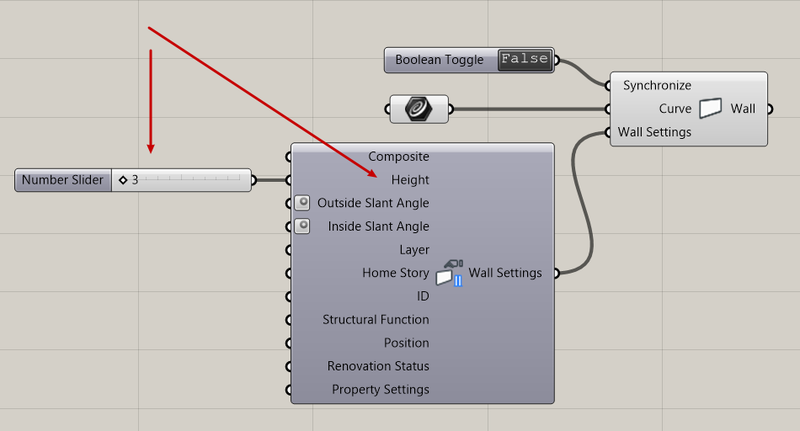 It’s less parametric because you can’t connect parameters to other parameters as is possible with Grasshopper’s Settings component. Design your own Parametric BIM strategy with ARCHICAD and Grasshopper. Each time, choose whatever is appropriate. 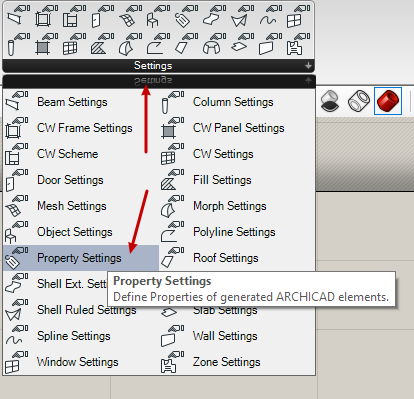 A third option to change a BIM element’s settings is to use ARCHICAD’s element settings. This is a bit tricky, though. The model will change accordingly. 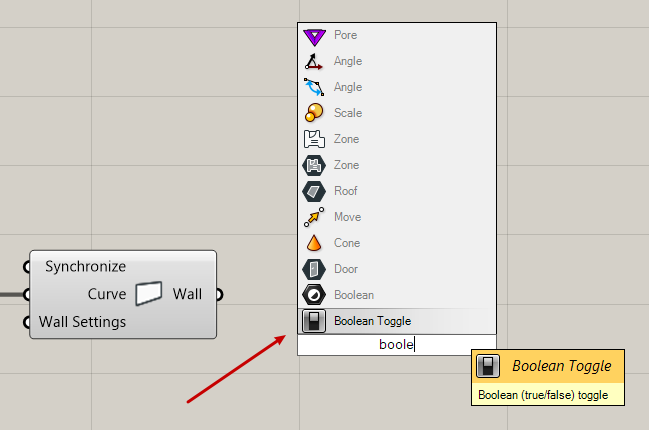 Now back in Grasshopper, when you switch Boolean on, you’ll see that your ARCHICAD model is locked again but the change remains. In general, changing Grasshopper-generated BIM geometry in ARCHICAD itself is pretty straightforward. 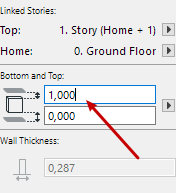 … the ARCHICAD wall will take on this new Grasshopper value as soon as you synchronize. Ignoring the changes you made in ARCHICAD before. 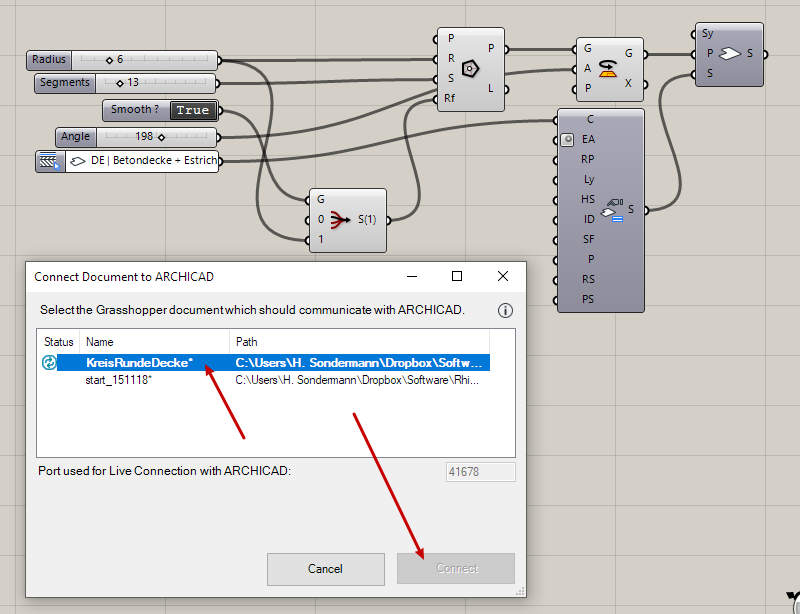 Even without working with Grasshopper at all, for a well-structured BIM model you should use favorites in ARCHICAD as much as possible to avoid inconsistencies. 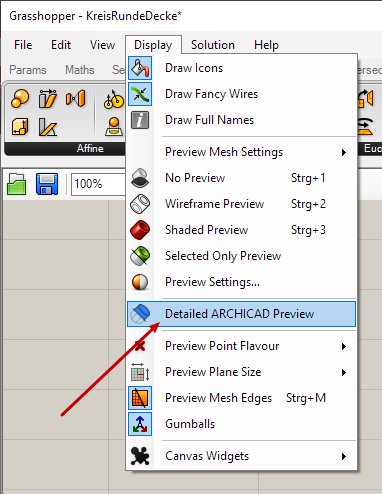 ARCHICAD settings are not parametrically controllable. 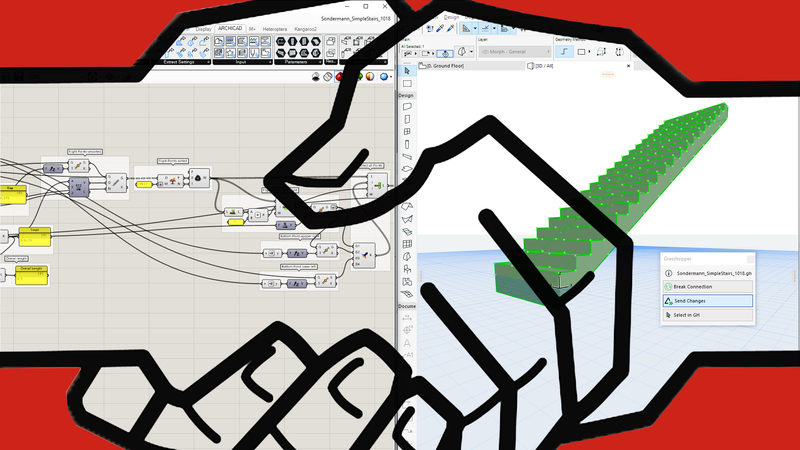 Find your own way of doing Parametric BIM with ARCHICAD and Grasshopper. Spend some time on planning your data structure. 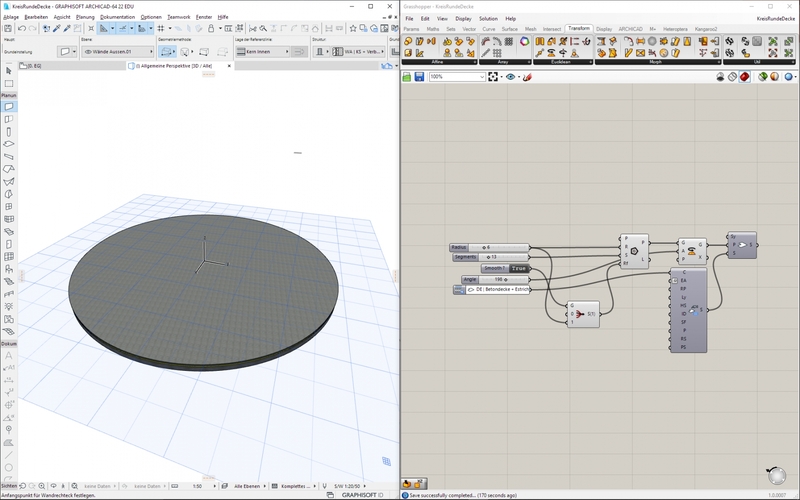 For Grasshopper-controlled geometry in ARCHICAD, can you make it standalone? Yes, of course. When your BIM geometry doesn’t need to be connected to Grasshopper anymore: Set it free. Just do as follows: Select the geometry and unlock it (Edit – Locking – Unlock). … and move the geometry off its original position. This duplicate of your geometry is now outside Grasshopper’s control. Now, you may keep your original Grasshopper-made geometry to develop another version, or delete it altogether. 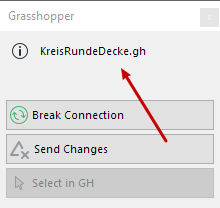 .. it means that this Grasshopper file is not connected to an ARCHICAD project. Your installation may not work – Graphisoft’s Forum pages are full of related posts. Here is the solution. So be sure to check out these two locations when you encounter problems. 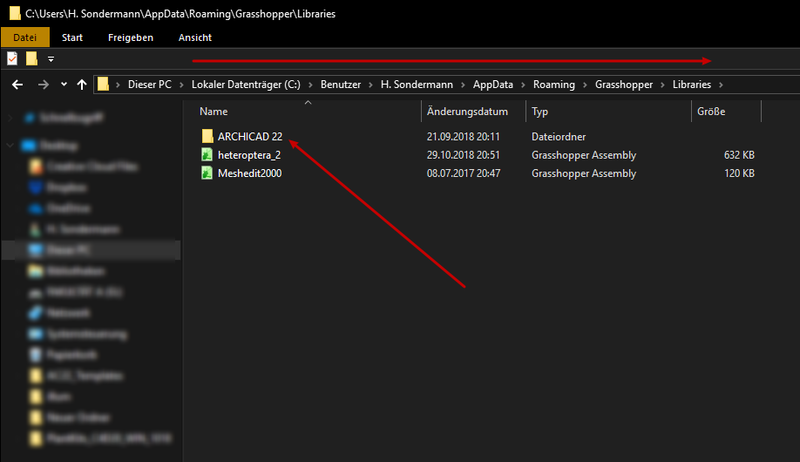 Now, in case the ARCHICAD-Grasshopper-connection doesn’t work, most probably the installation went wrong. The plugin files are already installed in older versions of ARCHICAD or Grasshopper. In this case, search for theses files (see above) and delete them. The plugin files have not been installed before, but you have more than one ARCHICAD or Rhino3D installed on your system (e.g. 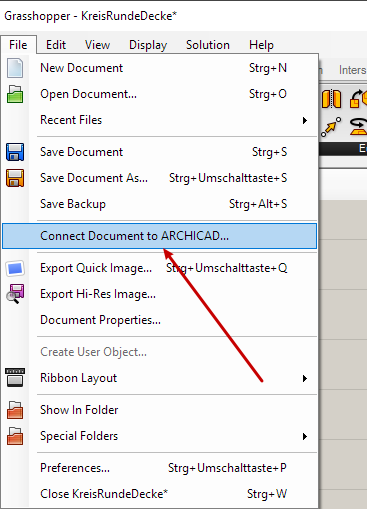 ARCHICAD INT and GER). Again, search for the files and move or copy them to their correct locations. Nothing worked. Until I found this article on Graphisoft’s Help Center pages. The solution was to run a Terminal command, and it did the job. I would highly recommend reading it so you don’t lose time with any misconceptions about this kind of workflow. For a change, you might want to watch some videos on this topic. 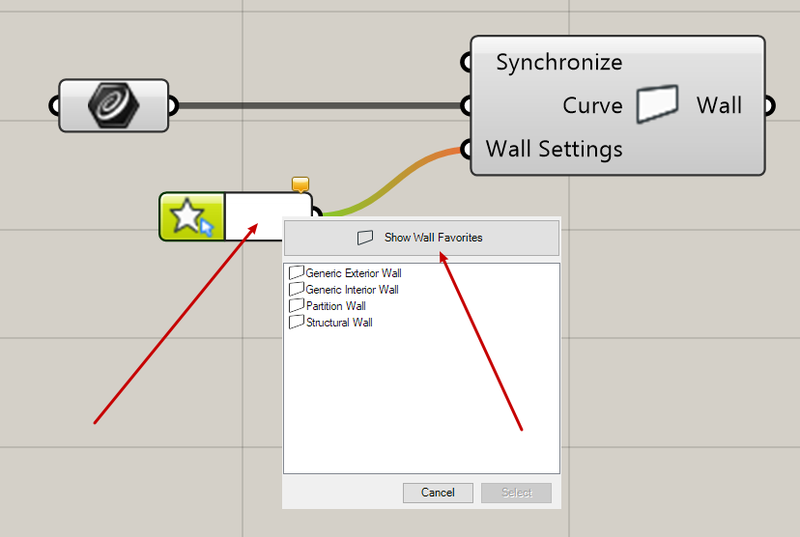 For example, here you can see how Parametric BIM works for ARCHICAD’s Curtain Wall tool. The same YouTube channel provides some more basic tutorial videos here. I myself have written another article on how to start in Grasshopper here and here. I will write many more articles about building actual models with Grasshopper and ARCHICAD and put them here, too. Once more, a reminder that Graphisoft itself has produced a User Guide for this whole stuff. And again, if you have this specific Mac-Installer problem I had, there is help here. 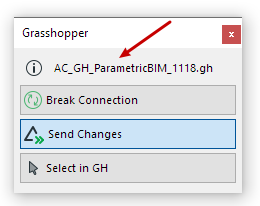 The ARCHICAD-Grasshopper Connection empowers you to do truly Parametric BIM. 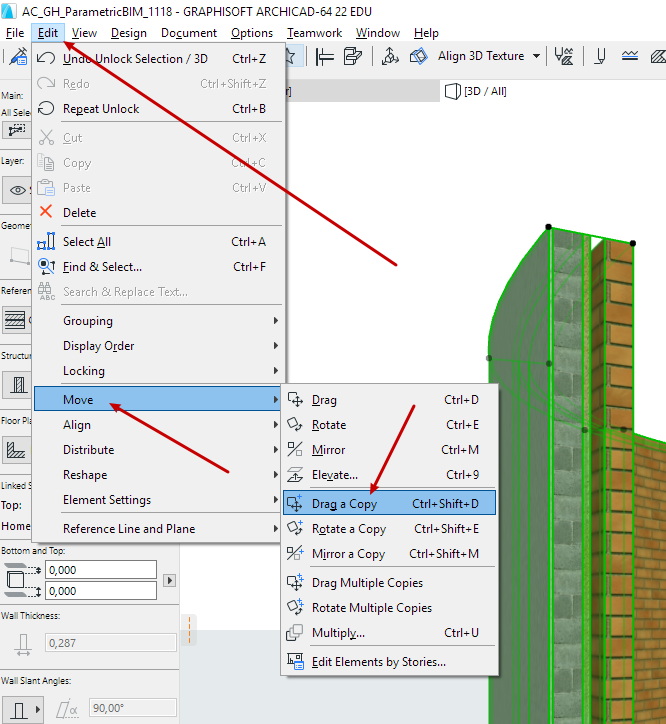 ARCHICAD’s BIM authoring capabilities meet Grasshopper’s powerful Parametricism. Along with growing potential the workflows starts getting more complex, too. However, I hope I could shed some light on the basic framework of this new tool collaboration. Now, pick a design task, and start researching! Create parametric BIM geometry with ARCHICAD and Rhino3D Grasshopper. Learn how to use Graphisoft's free plugin to make your favorite CAAD tools work together.